Like many enthusiastic cooks, I have a bit of a cookbook collection. Some books I use mostly for reference, some I keep only out of nostalgia (or, more embarrassingly, because hey-I-might-need-THAT-Sri-Lankan-recipe-someday! ), and others are in heavy rotation. Also, I just love books in general. I always have a cookbook or two on my bedside table, which I occasionally read as bedtime stories. But the cookbooks I like most are the ones that inspire me to branch out in my preparations of the humble vegetable. I think I have mentioned before that Seattle is graced with five months of springtime, which means greens galore in the garden. Arugula, chard, kale. Radishes, turnips, peas. Repeat. Springtime all the way through until August, when we may (or may not) see a little flourish of zucchini and cherry tomatoes to end the growing season. We belong to a couple of CSAs to fill in the gaps. So I’m always looking for ideas to churn through the produce while keeping both the cooking and the eating enjoyable around here. This year I am going to be brandishing a new cookbook in the kitchen. I just got my copy of Ripe today and I’m smitten. It’s an homage to fruits and vegetables as much as a cookbook, really. It’s written by Cheryl Sternman Rule, the witty and eloquent voice behind the 5 second rule blog (she’s the one who brought that Quick Whole Wheat Spice Bread with Brown Sugar, Orange Zest, and Walnuts into our lives, bless her heart). It’s gorgeously photographed (click here to see some of the pretty pictures). Each fruit and vegetable gets a few pages: a glam shot, a few irresistible descriptive paragraphs, a featured recipe and a few “un-recipes”–my favorite part, of course–such as this one for carrot salad: “wide carrot ribbons + harissa + yogurt + green olives + parsley.” Yes! And if the first recipe I tried is any indication, the flavors pop as brightly as the colors in this book. A simple gingery dal, a plain pot of brown rice, diced red onion jewels glinting at first in the wide pan, then melting into a sweet and tangy and black-pepper-spiced chutney that transported us to some mad place where we wished winter weren’t so close to over. Oh, well, I’m looking forward to trying the radish recipes. Dal with Curried Red Onion Jam: First warm 2 Tb. butter and 1 Tb. olive oil over medium heat in a wide pan. Add 3 diced red onions, 1 tsp. kosher salt, and 1/2 tsp. black pepper. Stir occasionally until translucent, about 10 minutes, then stir in 1/3 c. dark brown sugar, 1 Tb. curry powder, and 1/4 c. cider vinegar. Simmer for a moment, then reduce heat to low and cook until jammy, 30-40 minutes, stirring occasionally. Meanwhile, make a pot of brown rice using one part rice to two parts water plus a pinch of salt. Bring rice to a boil then simmer 40 minutes, remove from heat and leave covered until ready to serve. And at the same time, make your dal using 2 c. sorted and rinsed red lentils, 7 c. water, 2 Tb. minced or grated ginger (I use my Microplane), a small fresh chile or dried chile flakes to taste, and 2 star anise pods if you have them (I didn’t). Bring everything to a boil then simmer uncovered 30-40 mins, stirring occasionally and adding 1 1/2 tsp. kosher salt and 3/4 tsp. freshly ground black pepper halfway through. When the lentils are completely soft, remove them from the heat, taste and adjust seasonings and discard the star anise. Serve rice topped with dal and a big spoonful of the onion jam. Here’s the big question, though: what kind of a grilled cheese sandwich am I going to make to use up my leftover onion jam? Sourdough with Gruyere? Rye and chevre? Help me out here, friends. This entry was posted in Asian Flavors, Beans and Other Legumes, Vegan or Would-Be-Just-As-Good-Vegan and tagged cooking, dinner, DIY, family, food, homemade, lifestyle, recipes, vegan, vegetarian on March 19, 2012 by emmycooks. What a great post and I am glad I am not the only one with cookbooks on my bedside table that are used as reading material. I have not heard of Cheryl Sternman before but I thank you for linking me to her blog and cookbook. I already ordered my own copy on amazon a few moments ago. It’s a great display book for my kitchen counter. I find I like to swap those out every few weeks and this one will make a colorful addition. Cheryl has a book signing in Seattle in June. I put it on my calendar and if you stop by as well, perhaps we shall meet. In either case, thanks for the recipe and inspiration! I am completely delinquent in responding to comments but I want you to know that I have thought of this one several times looking around my kitchen lately. I LOVE that you keep a display book on your counter. Often I can’t even SEE my counters! I can only aspire to have counters so clear that you’d notice one cookbook. :) (And this is a gorgeous one, so colorful!) I would love to say hello at the book signing, is it at Book Larder? I feel like I might have seen that on Twitter. I haven’t been there but am so excited to check it out. Thank you for the tip about the book and the blog, I’ve never heard of either, so I’m excited to get to know them. :) Your Dal recipe looks wonderful! And i can’t wait to try the curried red jam. It’s early, but now you’ve made me hungry :) Thank you for the inspiration today! I hope you did try it! So good. I finished the last of the onion jam today and I am thinking I will make another batch of the jam to use elsewhere. It got spicier as the week went on. Yum! I’m a cookbook junkie as well! 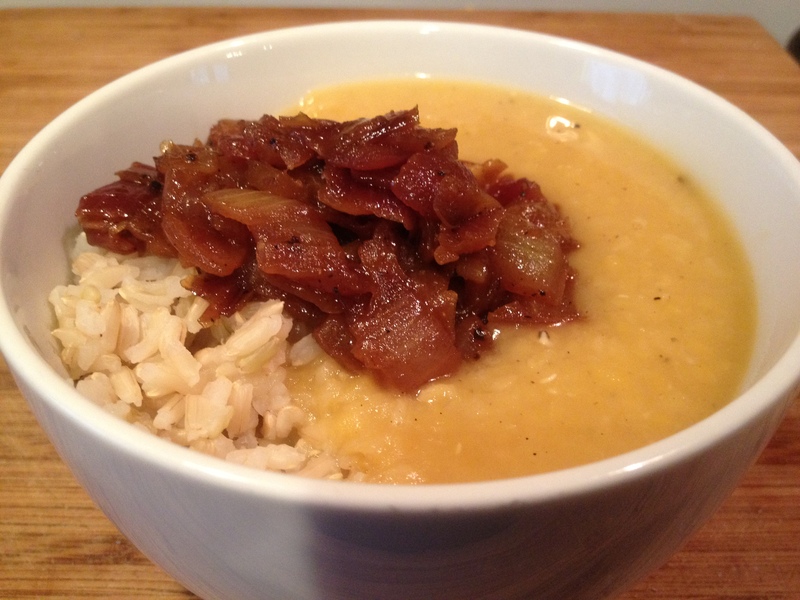 I LOVE red lentil dal – and with the red onion jam – wow! Mmm, looks fabulous. Nothing like dal and rice to make a satisfying meal. I’m one of those cookbook on the nightstand type of gals too! Good to know there’s more of us out there. This sounds like a beautiful book. I do love when the simple onion gets reduced down to a sweet jammy consistency. It was very good, I just finished it today. I loved the spicy curry with the sweetness of the onions. That looks so yummy. Gotta try that onion jam! Oh, and I’m partial to really good mozzarella for a grilled cheese myself. Oh, I want Tender. I love those Chez Panisse books, especially to use as a reference when I’m thinking about what to do with my CSA box! Wow! Looks and sounds delicious! Thanks for the introduction to the Ripe cookbook too! Am adding it to my reading list . . .